As my regular readers will have noticed, I've been doing a lot of German-oriented stuff lately. I'm doing most of this to prepare myself for my upcoming German exams in a couple of months (exams I must take for my PhD program). I find that when I spend time creating modules, I learn a lot, so, I have been making these modules available for free here at Pisteuomen. 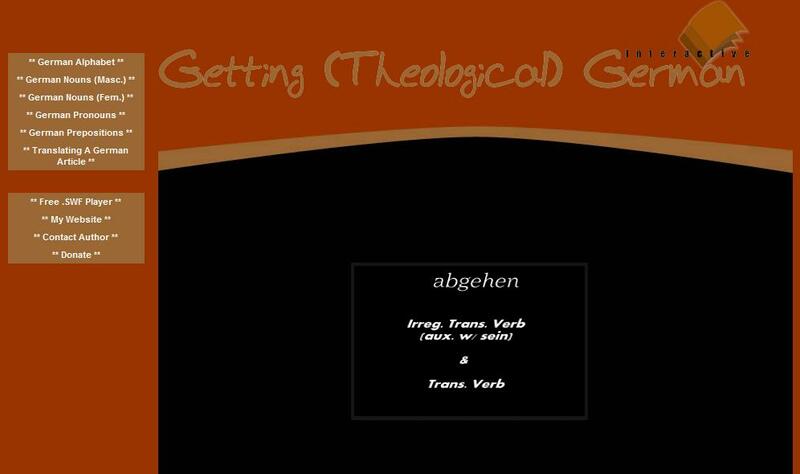 Well, now they can also be downloaded from a new website that I have developed: Gettin German. In addition to these free resources, this new site is vocab heavy and flashcard friendly. So, head on over to Getting German, download some free programs, use the flashcards and begin learning German. To go to the site, click the image below. After you've visited, feel free to pass the url on to others. Oh, and check the site frequenly as new flashcard sets will be added VERY frequently and new programs added on a regular basis. Enjoy!